Growing up in Utah’s sagebrush mountains with its rocky cliffs, it’s inevitable I’d see a rattlesnake. My mother warned me to be careful where I walked or played as a child. My dad was more adventurous; he took me out hunting for rattlesnakes when we were on picnics in the mountains of central Utah. Carrying a big stick, he used it to deftly hit a rattler on its head killing it instantly. Seeing no need for snakes in the world, he hunted them and collected their rattles. The boys in the family became very skilled at hunting rattlers. As far as I know none of our family was ever bitten, even grandpa who had been a sheepherder, outdoorsman and hunter all his life. 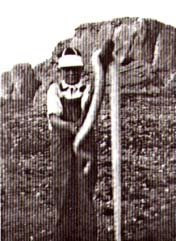 He respected snakes and stayed out of their way unless he was specifically hunting for them. I know some of the workers on his railroad work gang actually ate snakes for their scanty mealtimes. I guess that’s putting the reptiles to a good use. 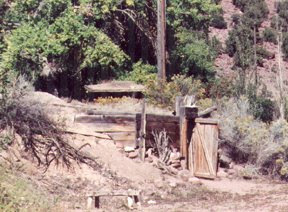 When some of my grandparents’ ancestors arrived in the Utah territory, they lived in dugouts (see photo on right) before being able to build themselves proper homes. Finding an available hillside, a small room was dug out. Walls of adobe or wood, and a roof of tree limbs covered with sod made for temporary living quarters. A stove or fireplace inside provided heat and light. Usually the opening for a door was covered with a blanket. I can just imagine the number and variety of living creatures including snakes that looked upon this newly constructed abode as inviting. When it rained, the roof invariably leaked and had to be patched. Living in dugouts with rattlesnakes doesn’t sound fun to me but it was all they had. Ugh. Not snakes, please, not snakes! OMG!!! I have this aversion for snakes. I avoid everything about them, looking at pictures of them, watching them on tv, reading about them --and the list goes on. I join linda, Ugh. not snakes, please, not snakes. Living in a dugout WITHOUT snakes doesn't sound fun to me. We camped in one for a few nights. The first night was kinda fun. The second night it rained. So much for having a good time. Not only was it a miserable night. But, the rest of the time was dank inside our temporary mountain home. Everything inside was at best moist and at worst muddy. We couldn't take things outside to dry, cuz everything outside was wet. There were no snakes, but there was a hefty number of other creeping, crawling things. You realize it's scripturally correct for Linda and I me to hate snakes.